If you are planning to spend your next vacation in Dubai, lying on the beach should not be considered as your only option. A sea trip would be a perfect setup for your upcoming vacation, and to experience it you do not have to be a marine sportsman or an owner of an expensive yacht – nowadays, it is absolutely possible to book a fully crewed yacht to spend a day on, or a fast speedboat to feel the rush of adrenaline as you are riding an upcoming wave. The possibility of having a relaxing trip or a romantic evening on board of a luxury yacht makes yachting an attractive way for all the sea lovers out there. You can either ride a quirky speedboat, or just enjoy beautiful views of a modern megapolis on board of a white cruising yacht – the choice is all yours. Dubai is a perfect place and a setup for this kind of leisure activities. You can gaze upon beautiful skyline of the city from the calm Gulf waters, that you would not be able to spot while going through concrete labyrinth of a modern Dubai. The weather conditions here were practically made for a perfect sea trip experience – 360 sunny and only 5 rainy days a year, make Dubai a perfect place for a yacht cruise. 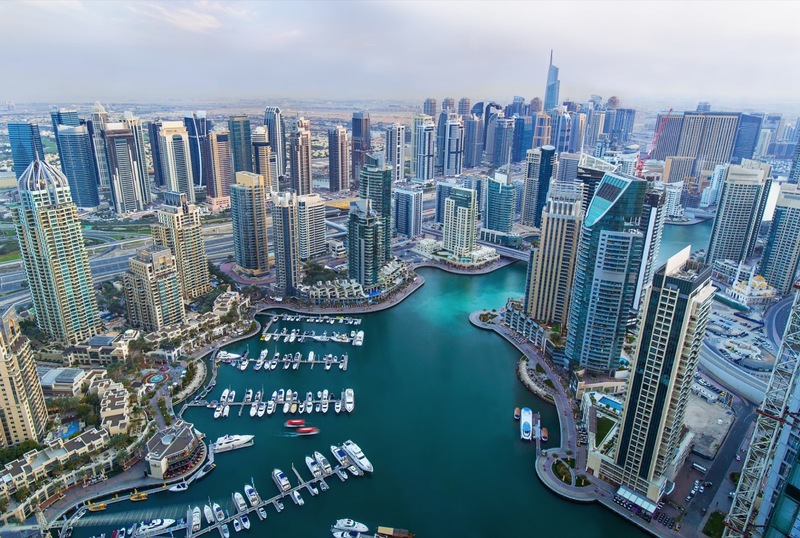 You can find a couple of world’s top piers in Dubai, but the most famous and luxurious of them all is, of course, Dubai Marina, that can accommodate up to 600 boats at a time. Here you can learn a thing or two about a marine craft and, of course, rent a yacht for a mind-bending cruise or a casual fishing trip. Aboard most of the boats you will already find a crew of experienced staff, that would be eager to help you out with anything and everything you might need. 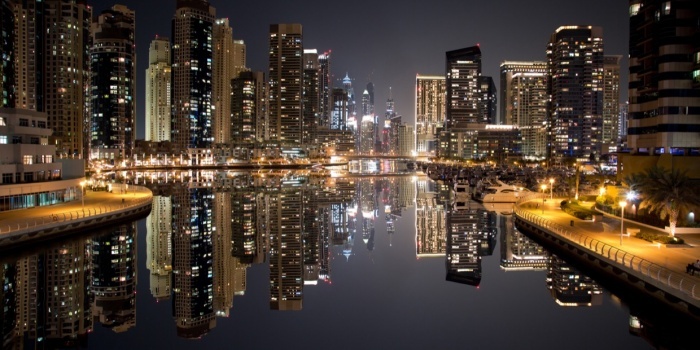 Dubai Marina is not just a pier, no – it’s a whole city district. Before you board your sparkling boat, you can spend a couple of hours just shopping in the famous Marina Mall, dine in a three star Michelin restaurant, stroll through an avenue covered with fountains and stare at the world’s most luxurious twisting building – Cayan Tower, also known as Infinity Tower. And after you are done with all that, you can experience the beautiful Marina skyline from a completely different perspective – from aboard of your cruising yacht. And now when you’ve started, why stop there – you can see a completely different side of Dubai, the one that can not be experienced by most of the tourist that spend their time on land. The feeling of a complete freedom and miraculous views of Dubai would be the greatest memories you will bring back home with you. The classic routes are designed to last just a couple of hours, so you can get back to your hotel after a nice sea trip. But you can also set sail for a couple of days, and visit not only those Emirates that can be found in a close proximity to Dubai, but maybe even neighbor countries, like Qatar or Oman. We strongly recommend to design your future trip in advance, so you can spend all your time on board admiring the views. You should find out what landmarks you would like to look at, which would outline the overall shape of your route. Please keep in mind, that a special permission is required to get to some famous landmarks in Dubai, so some preparations are necessary, in case you would like to visit those places. Places like Palm Jumeirah – the fascinating man-made island, located in the very heart of Gulf. This island was built in a shape of a palm tree (as a tribute to the company that owns it – Nakheel ( which can be translated as a Palm Frond from Arabic), surrounded by a crescent. Even if you decided to rent your boat for just a couple of hours, this would be enough to look at all the famous landmarks on Palm Jumeirah. Obviously, you would not be able to miss The Atlantis – the place once very famous for its fireworks during the opening ceremony in 2008 – with its signature bridge in between two gorgeous buildings. 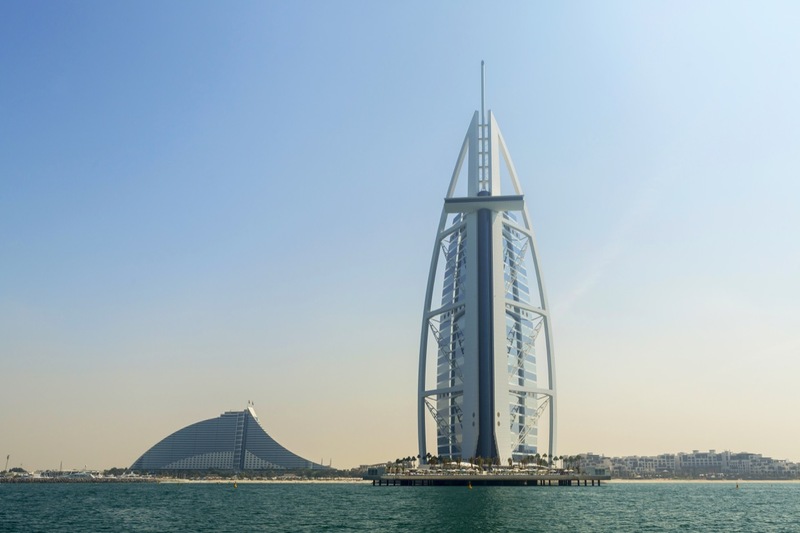 Just a little bit to the left of Palm Jumeirah is Burj Al Arab, build in a shape of an abra – old local kind of a boat. The world’s most famous “7-star hotel” is build on an artificial island, 280 meters into the sea. Continuing along the coast, you would be able to peak at a luxury complex Madinat Jumeirah, admire a Mina Seyahi (A Traveler’s Port in Arabic) lagoon, and get back to a beautiful Dubai Marina. If you want to spend more time on board of your cruising boat, you can, of course, extend a time of your journey up to 4 – 5 hours. 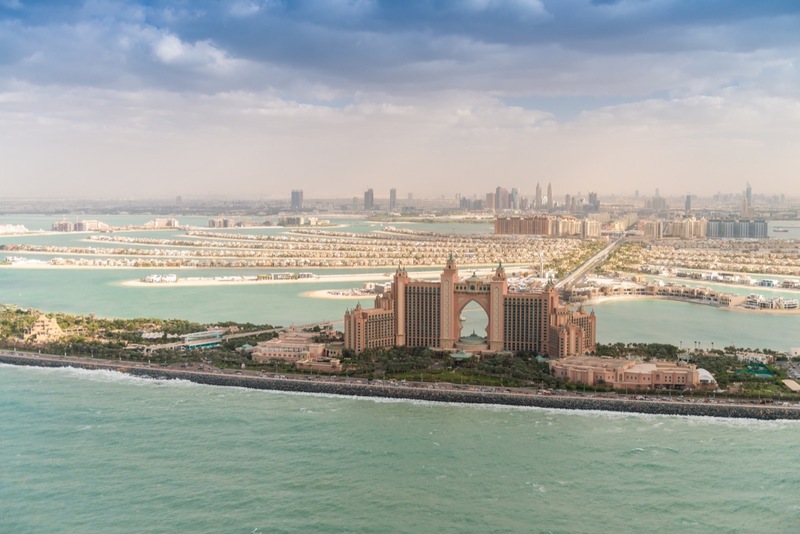 Once you’ve seen Atlantis, instead of continuing straight away to Burj Al Arab, you can head right to World Islands – the biggest artificial archipelago in the whole world, with a complex of 303 islands, each named after a specific country or city. From there, you can head straight to Hamdan island – a signature spot for a casual swim in the open waters of the Gulf. 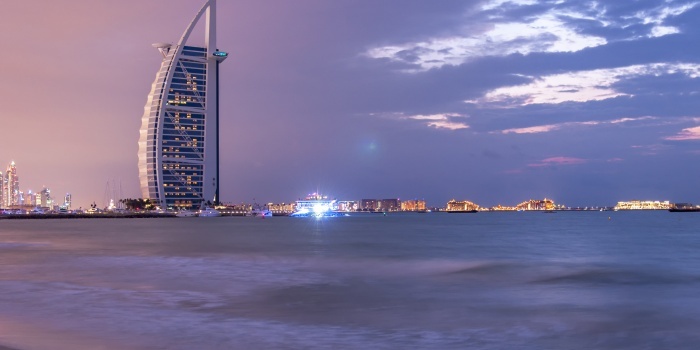 After you are done enjoying yourself, you can set your course straight to Burj Al Arab, and continue your trip along the coast. If you prefer something a little bit different, you can enter Dubai Creek through Port Rashid – a famous Dubai water artery, that divides the city into two parts – the old town and a new city. If you decide to do that, you would be able to see the fishermen huts from the old days, that can still be found in the old part of the city. But keep in mind, that this is an another spot that requires a special permission to enter, so please plan your journey in advance. If you wish to spend around 7 – 9 hours on board of a yacht, you would be able to see even more. Before entering Port Rashid, you can sail past Jumeirah Beach Hotel Marina and Jumeirah Beach itself, which is very famous for its white sand. And, of course, you would be unable to lose Burj Khalifa – world’s tallest (828 meters) building, out of your sight. A different option is to peek at Al Fahidi fortress – another signature landmark of the old part of Dubai. After you have entered Dubai Creek, you would sail past old Bastakiya district and another world famous landmark – Gold Souq, a place where any kind of golden jewelry can be bought, sold and bargained for. This would be a great spot for a late evening dinner, that would be a perfect conclusion of you cruise. You can admire an unforgettable cruising experience for a couple of days in a row – all you have to do is book a boat for an extended trip. Aside from exploring Dubai and its fascinating landmarks, you can set your course to some neighbor cities, Emirates and even countries. Once you get a permission to enter Abu Dhabi aquatorium, you would be able to see the biggest Emirate in the country. The views there are unforgettable: cleanest water, that sparkles right underneath the bright sunshine, numerous islands, long white sandy beaches – visiting Abu Dhabi should definitely be on your itinerary list. Spotting exotic fish and even turtles would not be a problem – a crystal clear water let’s you see deep down below. The capital itself is home for many architectural wonders and lush parks – Abu Dhabi is considered to be the greenest Emirate in the country. If you decide to go in this direction, you would also be able to see another Palm – Palm Jebel Ali. Eight sandy artificial islands can be found not far from the biggest man-made harbor in the world. If you are up for an extended trip, visiting a couple of Emirates in one day should also be considered as an option. Right next to Dubai is Sharjah – one of the oldest Emirates. Besides having a numerous amount of mosques, the capital city, also named Sharjah, is very famous for its bazaars, theme parks and architecture. One of the most recognizable buildings in the emirate is famous Etisalat Tower. Further to the north lies Ras Al Khaima (A Peak Of A Tent in Arabic), that is also very famous for its beaches and architecture. Julfar, an old town in the Emirate, is considered a signature landmark of Ras Al Khaima. Here you can find old fortified buildings, towers and military forts. You can even reach an Indian Ocean, that washes the UAE’s youngest Emirate – Fujairah. Steep rocky mountains cover the most part of Fujairah, and are easily visible from the ocean. The close proximity of sandy beaches and mountains create a one of a kind view, that is very different from what you would be able to see in Dubai or any other place. We would also recommend you to come to an anchor near an old fishing town named Dibba, which is considered to be one of the best places for a diving experience. As we have mentioned before, you can even cross the boarder, and go to Oman, Bahrain or Kuwait, who have common border with United Arab Emirates. Just remember to let your captain and crew know in advance – you obviously would need a special permit to cross the border in between two states. As you can see, yachting in Dubai is a great experience, that can be easily tailored to meet even the most specific requirements, and is definitely something that everybody should try for themselves – all the more so, the whole trip is easy to book in advance right from your computer, and can be finalized in just a few clicks. 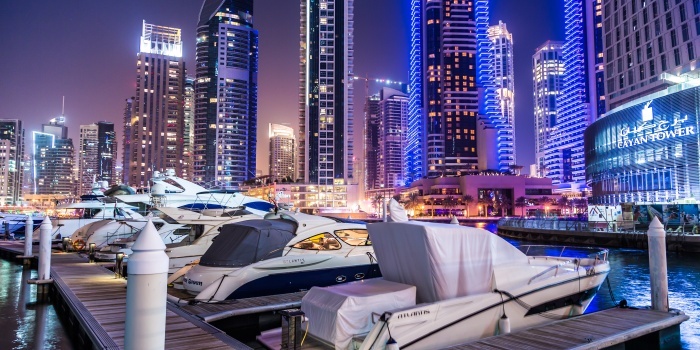 How Much Does a Yacht Cost in Dubai?